Using the correct lubricant to keep your eyes from getting dry, as opposed to treating only when they feel dry, is crucial for proper dry eye treatment. There two main categories of dry eye. For some, the tear production is low. For others, the tear composition is abnormal and the tears evaporate too quickly. It is possible to have a little of both kinds. For those that fail conservative dry eye treatment measures, there are oral agents, tear inserts, mild steroid drops (for a short time), Restasis (usually just 4 months but some need it longer), stem cell hormones, and serum drops. There are also punctal plugs which can keep the tears on the eye longer, but these not a good idea if you have blepharitis. The plugs can keep abnormal tears in contact with the eye longer creating more irritation. Many doctors will proceed step-wise through the above choices, but we tend to skip most of them because serum works better and is cheaper than most of the other options. Most patients never go back to any other treatment after using a short course of serum. Serum drops are made from the patient’s own blood. The blood cells are separated from the serum with a centrifuge. Human serum has lots of growth factors and hormones that can help dry eyes and has been studied with published results in major respected jounals. Typically, a patient will use the drop twice a day for two months. Unlike other treatments, the effect of serum drops last long after the two months you use them. The typical patient has 9-12 months of relief after using serum. In our experience, patients who try Serum rarely choose to retry Restasis. 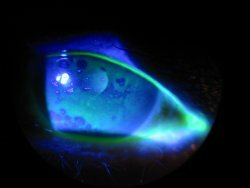 When blepharitis (meibomian gland disfunction) is causing the tear film to evaporate to quickly, it is important to consider cheap alternatives that are often more effective than treating with steroid eye drops everytime the disease flares up. 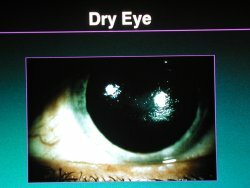 Many people with chronic dry eyes actually have blepharitis. Many doctors prescribe treatment for external blepharitis when internal blepharitis is the real problem. Shampoo scrubs of the lashes are a waste of time if the problem is the meibomian glands. Finally, a condition called conjunctivochalasis is often mistaken for dry eye. This problem is a mechanical one where the smooth skin over the white of the eye slides around when the patient blinks. The patient isn’t helped by lubricants and often feels something “sticking” when they blink. A simple surgical technique often fixes the problem. Unfortunately, some doctors charge up to $15,000 an eye for this surgery. With us, it is less than 1/5 of that and insurance often pays most of it. We see many patients with dry eye syndrome. We also see many patients who have been treated elsewhere who want a second opinion or a simpler, less expensive, or less time consuming dry eye treatment. Contact The Eye Clinic of Florida at 813.779.3338 to treat your dry eyes. For more information on how to relieve dry eyes click here.